Eva Jiřičná is a world-renowned architect. On the occasion of her eightieth birthday, in cooperation with AI DESIGN Studio, the DOX Centre for Contemporary Art has prepared an extensive exhibition exploring various aspects of her work from the 1960s until the present day. The exhibition will be open until 12 August 2019. The JIŘIČNÁ exhibition uses multimedia installations to present the work of Eva Jiřičná, who is a world-renowned contemporary architect and is also one of few women to have succeeded in this until recently purely male profession. The exhibition will feature samples of original design documentation and architectural models for a number of Eva Jiřičná’s important projects. 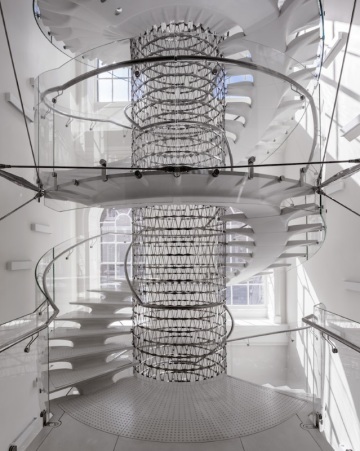 The centrepiece of the exhibition is a monumental glass staircase created in 1994 for the interior of the Paris branch of the Joan & David retail network. After the store closed in 1998, the staircase was disassembled and was transported to the Czech Republic on the personal initiative of Jiří Kejval. After more than 20 years it has now been restored especially for the exhibition at the DOX Centre. Eva Jiřičná is a proponent of “high-tech” architecture, though her work also contains echoes of organic and minimalist architecture. Her designs are characterized by elegance of shape, lightness of expression, and above all harmony between form and function. Her combined technical and artistic education allows her to simultaneously take an artistic and precise approach to her work, an ideal combination when it comes to architecture. Eva Jiřičná graduated from architecture at Czech Technical University in Prague, and continued her post-graduate studies during 1964-1967 at the Academy of Fine Arts at the studio headed by Jaroslav Fragner, who influenced her above all through his demand for a deep understanding of designs and their clarity and simplicity. “I can begin only when I absolutely understand something and when I know what I can expect from it. I want the essence of the design to be as simple as possible,” says Eva Jiřičná. After emigrating to England in 1968, Eva Jiřičná worked for the architectural department of the Greater London Council and worked on social housing projects. Later she participated in the innovative development of English cities - she worked with Louis de Soissons Architects, a prominent architectural practice, designing a new harbor in Brighton that became a laboratory for the new high-tech movement in architecture. Together with architect Jan Kaplický, whose work the DOX Centre featured in a solo show in 2010, she worked on a design of boutiques and shops at the famous Harrods department store. Eva Jiřičná ability to create fascinating interior worlds that react in a sensitive manner to human imagination was also appreciated by architect Richard Rogers (among other things the designer of the famous Centre Pompidou in Paris), who at the end of the 1970s asked her to work with him on the head office of the insurance company Lloyd’s of London. At that time this daring and eruptive steel, glass and concrete structure represented the most progressive project in London’s City district. Later Eva Jiřičná began to apply her experience to her own designs, in which she combined two quite different areas - interior design and architecture. She rose to prominence especially due to her interiors of fashion shops and boutiques in London, New York, Paris, Los Angeles, San Francisco, and other world-class cities, and became famous for (among other things) her sophisticated staircases, for which she was the first to use glass as a structural element while elevating them to works of sculpture. In 1984 in London she opened Eva Jiricna Architects, and in 1999 in Prague, together with architect Petr Vágner, she launched the AI DESIGN studio, which is celebrating its twentieth anniversary this year. 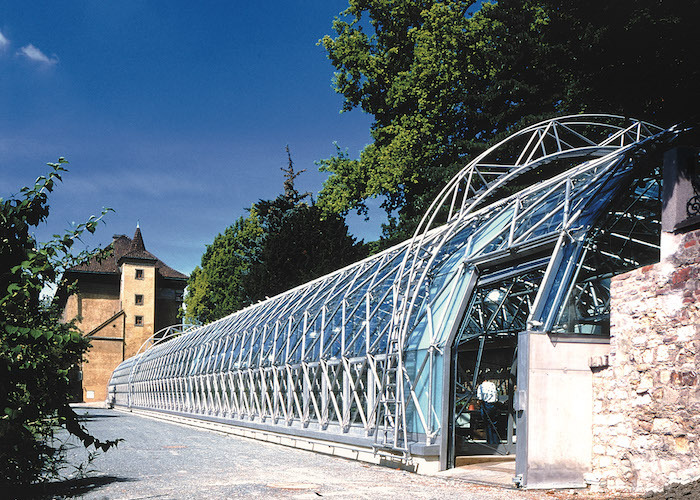 She worked on a number of projects with President Václav Havel, such as the Orangery in the Royal Garden of the Prague Castle or reconstruction of the interior of the Church of St. Anne. Thanks to two additional important Czech projects, Tomas Bata University and the Congress Centre in Zlín, she was also able to return to the town of her birth. Eva Jiřičná has garnered worldwide respect and recognition for her conceptual and technical rigour. 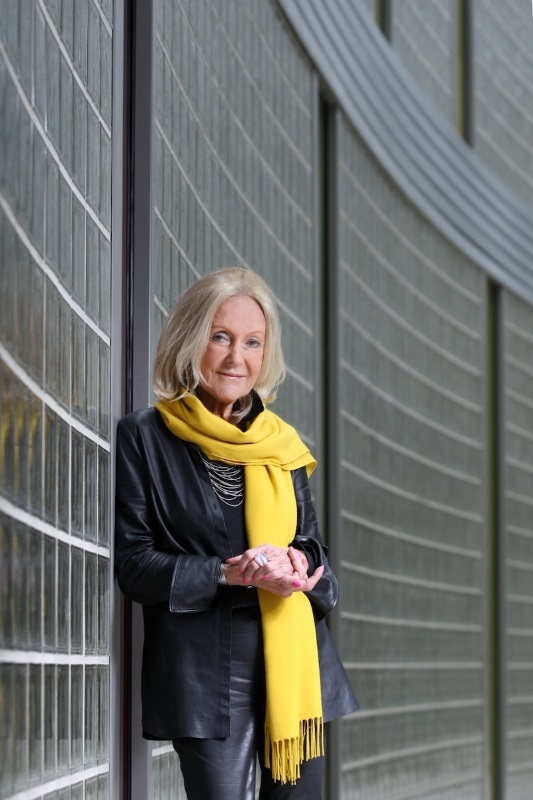 She has received a number of prestigious awards, among the most important being the Order of the British Empire (1994), the Jane Drew Prize for an outstanding contribution to the status of women in architecture (1994), and the Medal for Lifetime Achievement in Architecture at the London Design Festival (2018). The exhibition will be open for viewing at the DOX Centre from 22 March to 12 August 2019. 22 May from 6:00 p.m. - VISIONS OF PRAGUE / Eva Jiřičná as inspiration for Prague. A discussion panel in cooperation with the ARCHIP private school of architecture. 19. June from 6:00 p.m. - PANEL DISCUSSION on the subject of women in architecture, moderated by Milota Sidorová (Women Public Space Prague). EVA JIŘIČNÁ’S LONDON - A lecture held in London in cooperation with the Czech Centre. NOISY TALK - Architecture and design in the form of a lecture for parents and their children. Be warned, it will be loud! 31 March, 14 April 12 May., 26 May, 23 June, 14 July, 11 August - from 4 to 5 p.m.
Umění v kapse / Art in Your Pocket - Where is the border between art, design, and architecture? The viewer as the co-creator of a work. S kůží na trh / Bodies on the Line - Why is variety important (not only) in architecture? And what role does personality play? Prostor k manipulaci / Space for Manipulation - Every building defines its space. How does such a space define and restrict us?